Reports are circulating the internet that Nintendo are experiencing manufacturing problems of the Wii U and will need to delay the European launch from November to early December. The delays are reportedly caused by the Wii U GamePad which the final specifications were only revealed in June this year. The U.S. launch will not be affected as Nintendo are keen to release before Thanksgiving and Black Friday which can massively boost sales. 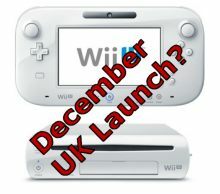 It had been earlier suggested that Nintendo might even delay launch to 2013 due to manufacturing problems, however this has now been dismissed by people in the know and the company is certain a Q4 2012 launch is on the cards. Nintendo famously had numerous difficulties keeping up with demand of the original Wii Console which was launched late 2006. Christmas 2007 saw chronic shortages in the UK with a mad scramble of sales every time stock was released. Analysts suggest that the Wii U will not be able to replicate the stunning success of the original Wii as it's a more complex proposition to present to consumers and thus much harder to market.